(CNN) - Newt Gingrich earned praises this week from former adversary Bill Clinton, with whom Gingrich butted heads during his tenure as House speaker in the 1990s. In an interview with the conservative online publication Newsmax, Clinton said Gingrich’s positions on immigration would help him appeal to independent voters. “He’s articulate and he tries to think of a conservative version of an idea that will solve a legitimate problem,” Clinton said. At Tuesday’s CNN National Security Debate, Gingrich staked out a position that he said was a “humane” approach to immigrants who are living in the United State illegally. "If you've come here recently, you have no ties to this country, you ought to go home, period," Gingrich said Tuesday. "If you've been here 25 years and you got three kids and two grandkids, you've been paying taxes and obeying the law, you belong to a local church, I don't think we're going to separate you from your family, uproot you forcefully and kick you out." Clinton said the idea was a good compromise between positions offered by the left and the right. “That sort of splits the difference between the immigration reforms proposed by President Bush and President Obama, which would give a path to citizenship, and would be a version of what President Reagan did,” Clinton said. Clinton wouldn’t predict a win for Gingrich in the race for the GOP nomination, saying other candidates including Mitt Romney were still putting in strong performances. In the 1990s, Clinton and Gingrich were often at odds as the leaders of their respective parties. A standoff between the two men over federal spending led to a government shutdown in 1995, and Gingrich was at the forefront in backing Clinton’s impeachment on perjury charges. The two did work together on certain legislation, including welfare reform later in the decade. For those who think that Bill Clinton's favorable comments of Newt Gindrich is a set up for his failure down the road, you better think twice....just tune in to a Republican 2012 commercial coming near you soon. Wonder what that 2012 GOP commercial may say? Well, "former President Bill Clinton who once supported President Obama, now supports Newt Ginrich for President and has praised the former House Speaker for his intellect, thoughtfullness and sound leadership. No, that is not what Bill Clinton said but look for the GOP to twist what he said to score political points and influence prospective voters as usual. Bill Clinton ought to know better! 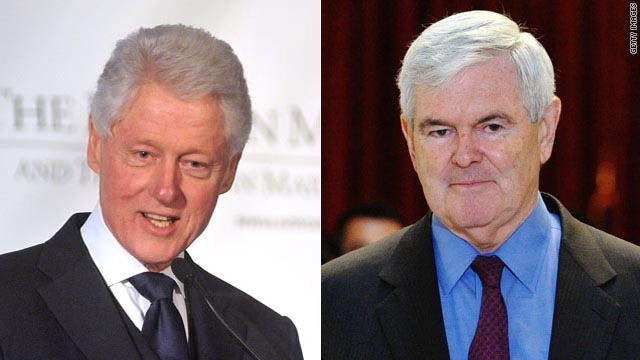 Bill Clinton is a political animal through and through; he knows the value of discretion, especially with a corporate-backed highly connected Washington rabid pit bull, like Gingrich – who doesn't stand a chance of being prez but is highly toxic in contiguous realms of power. Always watch when a politician first refers to another pol as "articulate" ... a dodgy, empty compliment that screams "Watch your back w/ this one." After being treated so badly by Newt Gingrich, I'm more than a little surprised by Bill Clinton's words of praise for him. I remember the impeachment trial so vividly. Gingrich seemed to just relish going after Clinton as did Henry Hyde!! He is like "the pot calling the kettle black," and he did it with a huge, sarcastic grin on his face. Gingrich and many others, including those right there in Congress are no doubt guilty of lying about their affairs, especially if they have a child. Clinton wasn't the first to lie and he won't be the last politician or person to lie about an affair There are so many other things the Repubs and Dems could spend their time on;. Rather than use their time for airing the gory details of a person's affairs, after watching "60 Minutes" on Nov. 27th, they should do something for homeless school kids (and others) who are homeless because their parents are not able to find jobs. It's heart-breaking to see anyone down on their luck like this and some people add insult to injury saying "the parents are just lazy." I'm for helping people anywhere in the world, but we should remember......CHARITY BEGINS AT HOME!!!!!!! Fight Latino Occupiers sounds like the type of person who would like to forget that his ancestors came to these shores and helped settle the problems with their own illegal immigration by the judicious use of smallpox, measles, syphilis, cholera, and liberal administration of one to two ounce pieces of lead delivered at a rate of 300fps or higher against the people already here. Like other commentators, I have to wonder why the emphasis is on punishing those who came here to find work, and not those who willingly employed them. The last employer of note who was fined for hiring known illegals just happened to be a kosher meat processing facility. How come the INS hasn't gone after the construction companies in the sun belt that relied on those same illegal immigrants to build all the luxury homes that none of them could ever hope to afford? Is it because they were too well connected to people like Rick Perry?